��It is an excellent opportunity to reminisce and to visit with old friends. Lifetime friendships and bonds were formed on the grounds of the Schools in Oconee County. We have a proud legacy and should encourage and support our county school system. 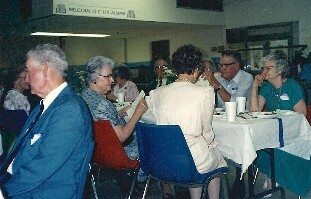 The Annual Alumni Banquet will be held at the Oconee County Civic Center starting at 5:30 PM on Saturday, June 25, 2011. The OCHSAA will also hold its annual meeting presided over by President Jimmy L. Christopher, OCHS Class of 1958.A ‘Meet & Greet” reception will be held at Oconee Middle School (Old High School) on Mars Hill Road from 4:00 to 5:30 PM. Banquet Reservations are $ 25.00 per person and the facility will limit attendance to 450 persons.So send in your registration money early, as well as information about your graduating class and name, address, phone no etc. Don’t miss the fun and fellowship by not registering or attending.